In case it hasn’t hit you squarely in the face each time you’ve gone into a shop, embroideries are everywhere. A friend and I were recently discussing this phenomenon which has besieged the shops with relentless tenacity. I expressed the opinion that I am not convinced that this is one bandwagon I’m overly excited to hitch a ride on. Don’t get me wrong, I love embroideries, but I’d tend to prefer them on floaty summer dresses as seen in the Pat Bo Spring Summer 2017 collection. This dress I would happily sell a kidney for and wear it everyday until someone tears it off me, because they can’t bear to see it anymore. Or because they love it as much as I do. This trend which has featured on the Gucci catwalk since SS2016 has gathered momentum rather than slowing down. 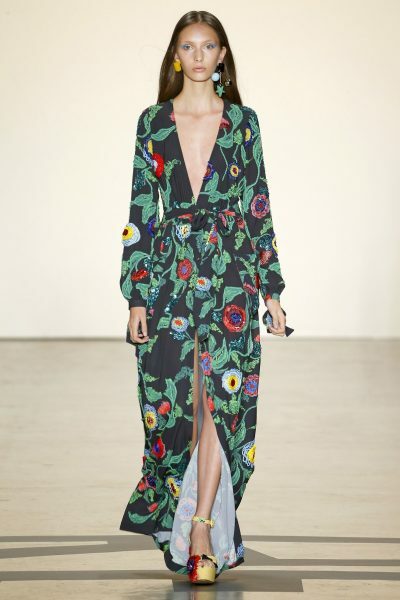 Other designers such as Dolce & Gabbana, Stella McCartney and Alexander McQueen also featured heavily embroidered garments and accessories in their SS17 runway shows, on everything from leather jackets, handbags, shoes and jeans. It seems like it’s here to stay a while longer. With this in mind, I thought I’d have a look to see what I could find and if it would potentially change my mind. There is plenty to choose from which is attractive and well made, but there are also some creations that had me grabbing my sunglasses and reaching for a sick bag to retch into. Lets throw a whole lot of colours and stitches at one garment, and then, for good measure, lets add a few a few more. Vertigo on a shirt. I won’t name and shame, I am sure that there will be plenty of versions of this trend where the designers have become somewhat overzealous and not got the balance quite right. And some people will like these. Thank God for sunglasses. I did find myself pleasantly surprised to come across a few garments that I would consider adding to my wardrobe. 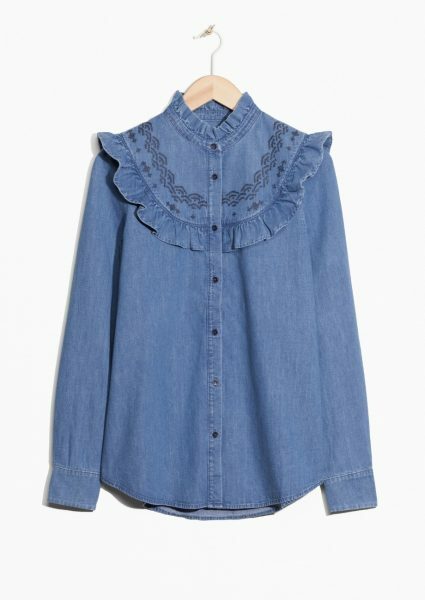 A firm favourite, if like me you are a bit sceptical of this trend, is a Frilled Denim Blouse for £55 from & Other Stories. It’s simple, understated and it also ticks off the ruffle trend which is another big one for the season. If you have no patience for shopping, then look no further than Zara. They’re not on this bandwagon, they’re driving the wagon at high speed, offering a variety of styles and options. 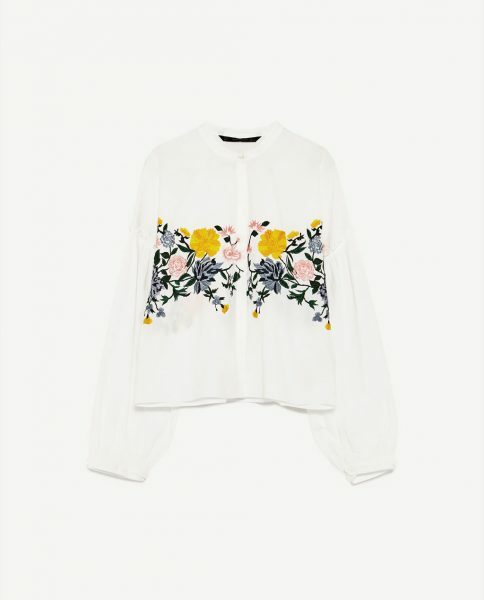 This Floral Embroidered Shirt from Zara is £25.99 – it makes a refreshing change from all the reds and pinks that are more prolific. It also ticks the box for another huge trend this season with its touch of yellow. 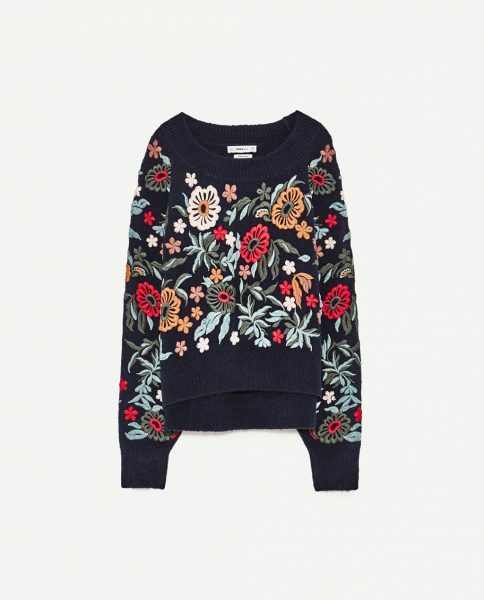 Embroidered Sweater, again from Zara is £79.99 – And yes, this one says “Go Big or Go Home”, but the colours are well balanced and the execution and pattern make this statement piece one to consider if you buy just one embroidered garment this season. 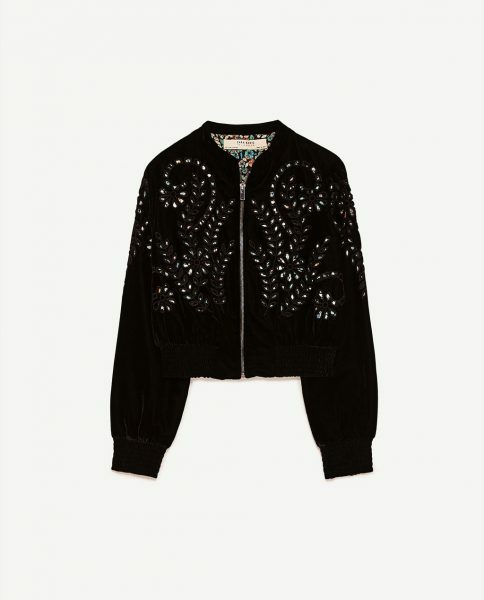 Embroidered Velvet Bomber Jacket from Zara for £69.99 – a very versatile item for your spring wardrobe, wear it with anything and everything. I was also quite surprised by a jumper I spotted advertised in Asda. 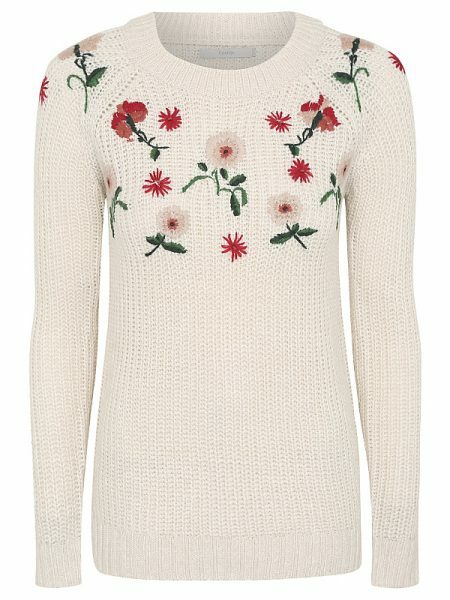 This piece of knitwear is priced at £16, so it is a very decent buy if you feel a little uncertain about this trend, but still slightly tempted to give it a go. 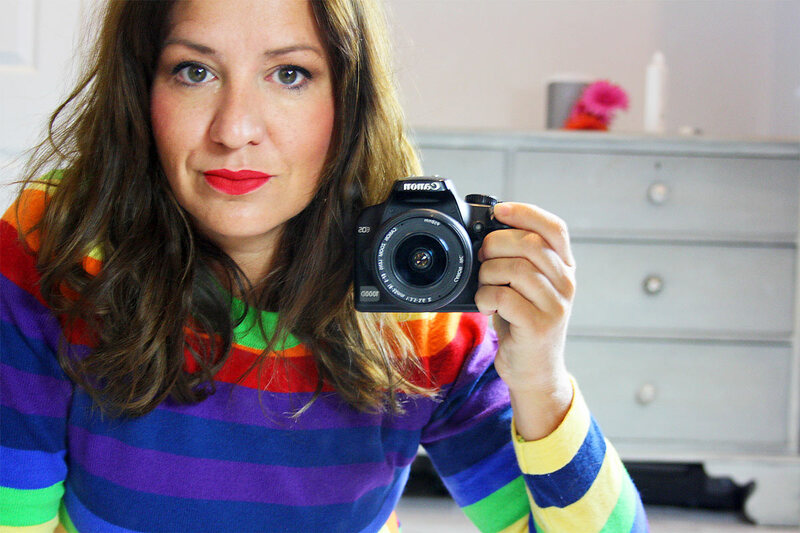 It’s a lovely item to throw on with your favourite jeans, for the weekend or the school run. I have not featured any embroidered jeans. I do not think that this is an item I can get on board with, and although I am anti-ageist when it comes to clothing choices, this is one fashion trend I am going to leave to the younger generation. That’s not to say you should not wear them, whatever your age, but I’ll give them a miss. I have short legs, I generally steer clear of any patterned trousers to avoid looking like an over-dressed hobbit. 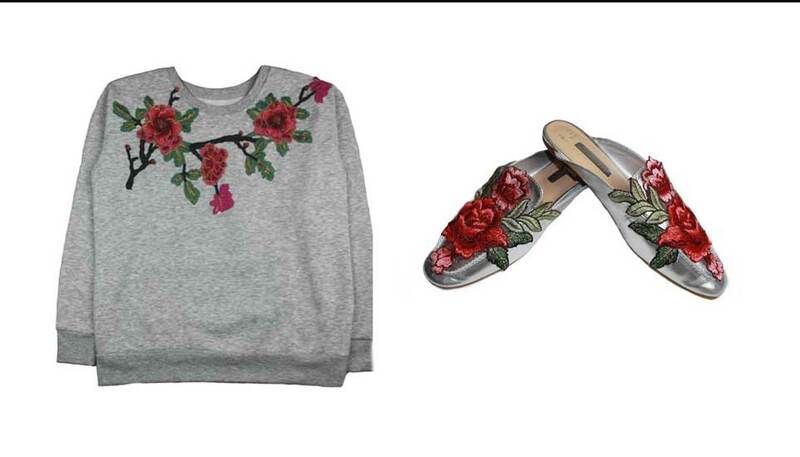 The one amazing thing about this embroidery trend, in my view, is that there is huge scope for you to customise and create your own gorgeous pieces if you are feeling a bit creative. When I spotted a pair of Alberta Ferretti mules in a magazine, I thought, “those are cute, but not £615 cute”, it got me thinking. 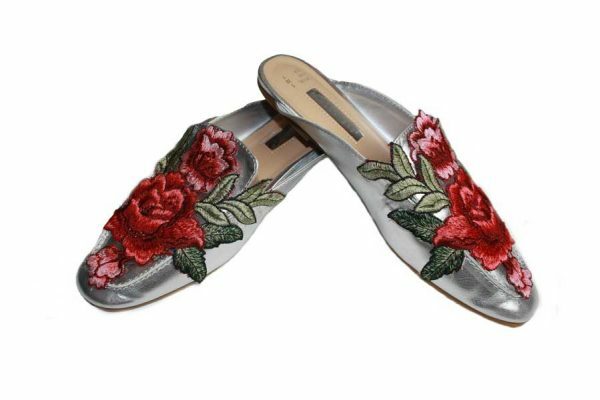 And this is what I came up with – my very own version of embroidered mules. These cost me a sum total of £11 to produce, but more importantly, they are unique. 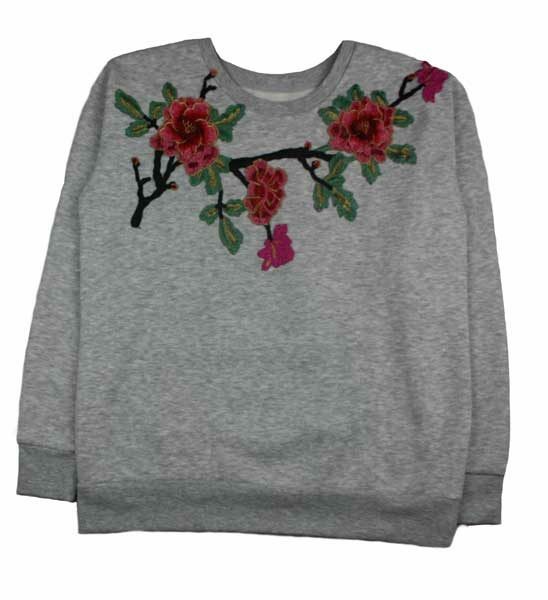 I decided to customise a sweatshirt whilst I was busy doing the shoes. 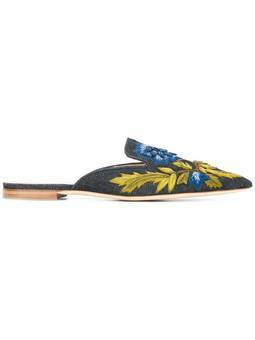 I was coming across some gorgeous embroideries whilst sourcing for the shoes, so it was difficult to resist. I love having items that are unique. If you do too, why not have a go at customising your own? Subscribe to my blog and I will send you the link to the two video clips, along with some sourcing details for the embroideries and the tools you will need. Don’t forget to follow me on Pinterest where I will have board about embroideries with more good items from my shopping trips and ideas for customising. And see how I wear mine on Instagram!